The third book of my Sydney triptych, Sydney by Delia Falconer is a delightfully produced little non-fiction hardback, part of a series on Australian cities. Other titles in the series include: In Search of Hobart by Peter Timms with an introduction by Robert Dessaix; and Brisbane by Matthew Condon. Forthcoming books include Melbourne by Sophie Cunningham; Perth by Wendy Were; and Adelaide by Kerryn Goldsworthy. At the recent Sydney Writers’ Festival where I attended a session titled ‘The Fascinator’ – Gail Jones, Ashley Hay and Delia Falconer spoke of their love of Sydney and the peculiar sense of ghosting and time slippage that occurs here. The moderator of that discussion, Jill Eddington, commented that she thought the three books – two fiction, one non-fiction – ‘speak to each other’ much in the same vein. And she was right. Reading them back-to-back-to-back I really saw the thread of time slippage and ghosting. Admittedly, it’s hard not to. Sydney is structured into ‘themes’: Ghosting, Dreaming, Living, Sweating, Showing Off. Each theme is divided into various entries which cover historical facts, myths, autobiography and personal viewpoints. What is provided therein is a rich vein of thoughts and conclusions on what this harbour city is all about. The book is very reminiscent in size, cover design, and look and feel to Peter Carey’s ode to the harbour city, entitled Thirty Days in Sydney, which is a wonderful book. Thirty Days was supposed to be the first in a series of travel books on global cities by authors, but I don’t know whether any others were published. Carey chose to show the history and character of Sydney by a series of interconnected short stories based around his own search for the truth of the city in coming back to it from his home in New York. 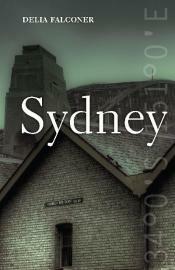 I enjoyed reading Sydney. It’s always nice to unearth new stories about the history and personality of the city in which you live. I’ve always considered myself very lucky to have been born and raised in Sydney and am grateful that I can still call it home. It’s hard to pick out a favourite anecdote from so many that Falconer has provided. There are stories about aboriginal peoples of Sydney, the first fleeters, and various colourful identities in the guise of the city’s underbelly. There are sad stories of murders and odd deaths. There is partying and glitz, the height of the 1980s reflected in none other than Geoffrey Edleston’s pink Lamborghini and purchase of the Sydney Swans. There is corruption and vice. There is the Cronulla riots. There is the celebration of many immigrants, including the great life (and funeral to match) of a Chinese man named Mei Quong Tart who established the many successful Victorian-era tea houses across the city and who would go around dressed in a Scottish kilt and quote Scottish poetry. There are many literary references too. Patrick White, Ruth Park, Eleanor Dark, Christina Stead and others are discussed in terms of their relationship with Sydney and how the city influenced their work. These sorts of insights are a treasure trove for us lovers of literature – and Sydney literature particularly. For instance, Stead’s childhood in Watson’s Bay, (her house there has been in the news of late owing to the renovations the current owner plans to make), was the basis for her 1944 novel For Love Alone. Park’s novel, The Harp in the South was very much based on her own experiences of grinding poverty. There are many anecdotes that sum up the city quite well. One of these is Falconer’s love (and my own) for the way in which, on the Millennium Eve harbour fireworks, the word Eternity was emblazoned across the bridge. The word is synonymous with Sydney and with another of our eccentrics, Arthur Stace, who used to chalk the word in lovely copperplate script on street corners across town very early in the mornings over the course of some 35 years in the middle of the 20th century. It was a masterstroke, something that Carey also paid tribute to in Thirty Days. Falconer provides the following additional anecdote: in 2001 the Sydney Council under then mayor Frank Sartor copyrighted Stace’s symbol under trademark law. Imagine that – a symbol of freedom and joy now constricted by the bounds of licensing laws, safe for official use! How’s that for irony? How’s that for Sydney? Another great panel discussion marshalled by Jill Eddington, this time on Sydney and how it speaks to three authors whose latest books are set in or are about the harbour city. I must confess I have not read any of these books yet (sigh), which, for a Sydney-sider like my good self is a bit poor, and after hearing each talk about their work it seems like even more of a shortcoming. Gail Jones has been nominated for the Miles Franklin Award three times. 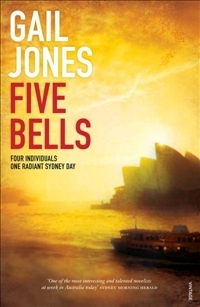 Her latest is Five Bells is a story of four adults and a child whose lives converge on a single Saturday on Sydney Harbour – specifically around the Quay area. Ashley Hay has written several non-fiction books, (I have Gum on my shelf, one that I like particularly). 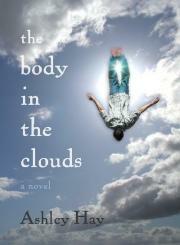 Her first novel is The Body in the Clouds, which has three different people in Sydney in different time periods (one of whom is William Dawes) witness the same amazing thing: a man falling out of the sky. It sounds like a great premise for a novel! One of the interesting points that Jill Eddington made at the start is how the three books speak to the others, and how they might be read as a triumvirate (I feel a possible reading task for the Dilettante coming on!). Jill asked them were they aware of each other’s work. Ashley had read a proof copy of Gail’s story. Gail knew of Delia’s book after exchanging emails with her about Kenneth Slessor’s famous Sydney harbour poem Five Bells, which they both love. Delia was delighted in writing a non-fiction book not to have the anxieties that a fiction author might have when they know another author is writing about the same thing. Ashley said that she had the unnerving reality of knowing Kate Grenville was writing about Dawes too, and indeed Kate made contact with her and they discussed their projects, which she was glad about as she could see that while William Dawes features in both their novels – being the focal point of Kate Grenville’s excellent The Lieutenant (see my review here) – she also saw that they were writing vastly different stories. The authors then spoke about the haunting that seems to live within Sydney, the sense of time slip, an obvious influence for Ashley’s book. Gail said the origins of Five Bells were in the haunting Sydney harbour ferry crossing the harbour in darkness (which made me think of another well known poem, Late Ferry by Robert Grey). For Gail, there is this sense of the brash light and modern structures but there are dark underpinnings, there are always currents moving beneath the city. There is this sense of slippage. Ashley loves the harbour just beneath the harbour bridge and the bridge itself becomes a character in her book. Ironically, it was in moving to Brisbane that allowed her to enter into her own imagination more which gave her the freedom to finish the story. Delia spoke of the sense of loss that underpins the city, the loss of Eora in the 1789 smallpox epidemic. She too pointed to the layers in the harbour and spoke of how the ‘fascinator’ of the session’s title spoke to her not just of the brash hat worn by ladies at the races but of a bewitching character she had read in a story that was known by such a name. Ashley thought that Ruth Park’s Playing Beatie Bow which she read in formative years (didn’t we all?!) is to blame for all this time slippage, saying that to her that Park’s story was real. There is a sense in some Sydney streets that you could look down them and not only see, say, the 1800’s, but actually feel like you are in the 1800s, so powerful is the undercurrent. The Rocks is one such place – the setting, of course, of Playing Beatie Bow. Gail said there is a wonderful record, I believe she said in the State Library, of photographs of buildings before they were demolished – ny building that was demolished was recorded in a lot of detail. The photos stretch back to 1890’s – a boon for novelists seeking a streetscape of a by-gone era. There were research gems for each author. Delia spoke of Reverend Franck Cash of Christ Church North Sydney who wrote an ‘insane’ book about the demolition of Milson’s Point to make way for the bridge when it was being built. He had photos of ‘ghost’ buildings in the act of falling down as they were being demolished. For Ashley, going to London and being able to flick through William Dawes’s original notebooks was thrilling. They are now online too. Gail said that she had a dinner with Kate Grenville in London when Kate was reading those same books at another time – a small world! Gail spoke about her Chinese research – one of her characters in Five Bells is a Chinese woman. Gail spoke to survivors of the Cultural Revolution when she was in Shanghai, as well as reading many accounts of that time. Her character comes to Sydney with that weight and shows strength to carry it forward. Of course, the harbour is the focal point of Sydney and is that way in these books too (no matter how hard Delia might have tried to avoid it at first!). Delia thinks the harbour is so suggestive. There is a ‘wateriness’ about Sydney. It’s there in the tides too. She feels the harbour is a mirror for us. Gail said the harbour is a stage – a ‘place for art’. She tried in her novel to recreate the novelty of those iconic things such as the Opera House and the bridge which many Sydney-siders take for granted (not me!). Ashley rounded off proceedings by saying an apt tribute to Sydney Harbour is the fact that it is used as an (international?) measure for an amount of water. In the recent Brisbane floods, she became very aware of ‘Syd Harbs’ – how many Syd Harbs were flowing down the Brisbane River.